We are linking with: Rebecca's Haiku My Heart. I love your haiku and the photo ! 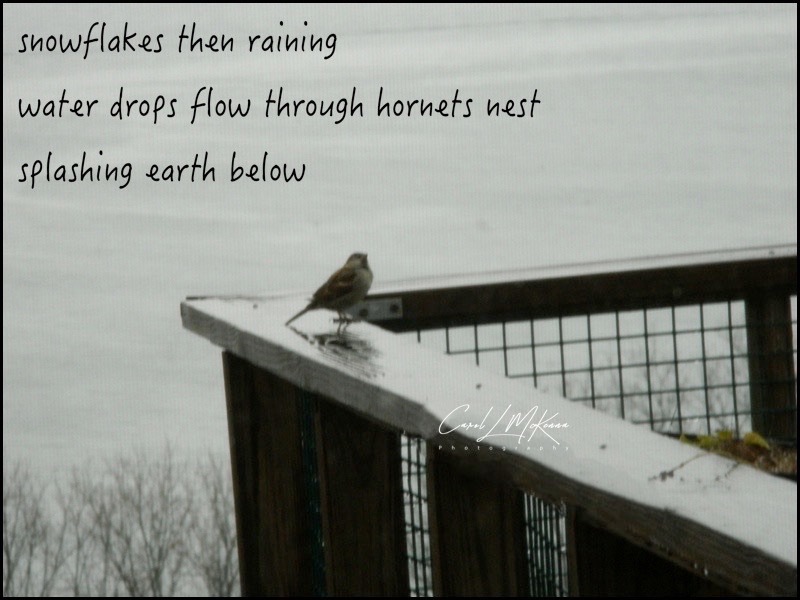 Hello dear Carol, thank you for this peek between the rain and snow and for this little bird. The image of the hornets nest is quite powerful! I hope you and Zoe are both warm and cozy. I send love across the miles to you both! Sounds like you have unsettled weather! Very nicely done. Winters must be a bit hard on all the critters that reside outside. that combination can be yucky. Great photo with the birdie. Wonderful poetry as usual too. Stay warm! Quite fitting for the shot. Such weather is hard on all the critters, but they are hardy. Poor little sparrow, I hope he doesn’t drown or freeze. thank you for your love through all the seasons!! !